You can purchase dart kits in our online shop. A properly made dart is the most important part of a spear throwing set. These instructions will take you through the process step by step. Wooden shafts made by Thunderbird Atlatl are made from the highest quality straight-grained ash. However, even the straightest grained wood may need some straightening. This is accomplished by simply gently bending the shaft in the opposite direction of the bend. This is most easily accomplished when the dart is relatively new. After several months the shaft will season in and become harder to straighten without heating. If this is the case warm it over a heat source such as a kitchen stove and carefully apply pressure in the opposite direction of the bend (be careful not to burn your hands). We recommend the use of thick leather gloves for this procedure. Apply light constant pressure, checking often to see if the shaft is straight. It is also possible to use a propane torch to heat the wood. In the process the wood may be charred or partly charred which allows some interesting decorative possibilities. After charring the wood and straightening the shaft, apply linseed oil. You may want to stain, paint or varnish your darts. Before applying a “hard” finish it is imperative that the dart is straightened first. You may also use colored indelible magic markers to crest your darts for a way to distinguish yours darts from those belonging to other people. The heat will allow the fibers on the inside of the curve to stretch and the fibers on the opposite side to compress. Cooling will allow the wood to “set” and remain straight. Be patient and work back and forth over the full length of the shaft until all the curves and bends are straightened out. The tip of the dart is already tapered for the field points that come with your kit. The ends of the dart are pre tapered and dimpled in the shop. Remember to apply oil or wax to these crucial areas, with the exception of the tip of the shaft where the field point gets glued on. Finish the shaft with a waterproof wax or oil. If you have applied finish at the tip or where the feathers will be glued, no problem, just scrape it away before the glue is applied. The best adhesive to apply the field tip with is “amber” hot glue, used in a commonly available hot glue gun or in stick form at archery stores. Put a small dab of the hot glue on the very tip of the dart. Heat the field tip at the open end, enough to melt the glue when it is applied to the tapered end of the dart, turning it almost as if you were tightening a screw this will smear the dab of glue all around the tip for better adhesion. The glue will set when it is cool. Wait until the glue is totally cool to the touch before casting it, or you will loose the tip. Do not put the glue into the hollow part of the field tip first as the glue will harden before you can attach it to the wood. A good alternative to amber glue is epoxy. Allow ample time for the epoxy to cure before using the dart. Next, trim the three feathers to the desired length, leaving a ½ ” tab at each end where the plumules are trimmed off. Tie the feathers to the dart with a 4-foot length of artificial sinew or thin thread. The strand of artificial sinew will split into four parts that are perfect for fletching. Be careful to separate it along the natural seams or it will “fuzz up”. Start by determining the location of the front end of the fletching. Allow 1 ½” from the back end of the dart to the back end of the fletching. 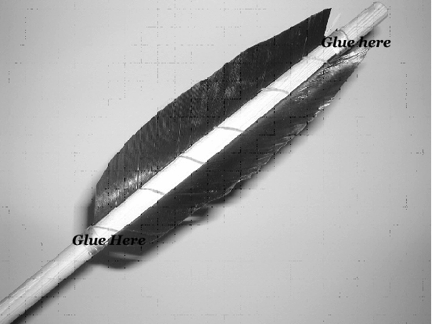 Use a dab of glue to embed the thread at the front end of the fletching. Roll just enough of the thread onto the dart until it “cinches”. Then place the first feather with the front tab centered over the thread. Wrap it twice and add the next feather the same way, then finish with the third. The three feathers should be evenly spaced around the round dart. After covering the tabs with thread, start wrapping the thread through the plumules in a helical fashion. The best results are achieved by wrapping at the same angle as the plumules lean back from the quill. Finish by covering the back tab with thread. Whip the end with a loop of thread, pull it through and snip off the excess. Smear a daub of glue on the thread at and snip off the excess. Your darts will last a long time if you store them either straight up and down or flat on a surface. Clean any dirt off your darts after use and re-oil them with linseed oil or tung oil once in a while. If your darts get crooked take some time and bend them straight especially before putting them away. As they season they will become stiffer and hold their straightness much better. Conversely, if you put your darts away wet and in a position where they are allowed to bend they will surely be crooked the next time you want to use them. Another common problem is leaving the dart sticking in the ground or target at an angle in the hot sun. After a period of time the dart heats up and gravity will provide the force to bend the shaft. Also avoid storing your atlatl set in a tightly sealed container such as a PVC tube for long periods of time. Sometimes it is necessary to use a moth ball to keep the feathers from being eaten by moth larva especially if you store your darts in areas accessible to the outdoors. Ash shafts are very durable and will stand up to thousands of shots if they are cared for. If the field tip comes off replace it before using the dart again. We could post a video at some time. It is about 35 inches long. It is not our most popular atlatl although it does have a pretty interesting look and feel. It was originally designed to shoot long, low spined dart. Hope this answers your questions. Sorry for the delay we have been away and didn’t see the comment. Yes you can use any material you like for darts. Bamboo works better than most materials. Sorry for any delay in answering this, we were away and didn’t check the posts.